A town so great they named the state after it! Well...not quite, but one thing is for sure: Idaho City is the biggest little city in Idaho! Idaho City is the county seat of Boise County and brags just under 500 residents throughout the year. Located just over 30 miles North of Boise the well maintained highway offers a scenic drive into the mountains of Idaho. Founded in 1862 originally under the name "Bannock" the small town soon boomed with the gold rush producing over 2 million ounces of gold. 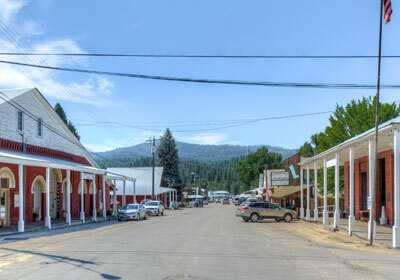 Today Idaho City is one of the best places in the state to catch the real flavor of Idaho all in one place; you can still find many historic buildings still in use today. Idaho City is home to a number of great community events throughout the year where the town puts on it's best and relives the glory days of old through special productions and street reenactments. The surrounding area boasts some of Idaho's finest examples of mountain living as well, including many premier subdivisions like Wilderness Ranch, Osprey, and Duquette Pines.